This map shows how temperatures during the decade (2000-2009) compared to average temperatures recorded between 1951 and 1980. The most extreme warming, was in the Arctic (shown in red). 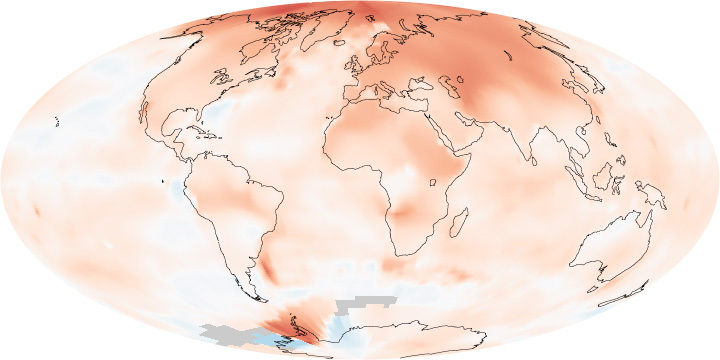 The blue areas are cooler than average, while the grey areas show places where temperatures were not recorded. January 2000 to December 2009 was the warmest decade on record. Throughout the last three decades, the GISS surface temperature record shows an upward trend of about 0.2°C (0.36°F) per decade. Since 1880, the year that modern scientific instrumentation became available to monitor temperatures precisely, a clear warming trend is present. In total, average global temperatures have increased by about 0.8°C (1.5°F) since 1880.